History will once again be made in the Windward Islands Anglican Community on 09 September 2013 when The Rt./Rev’d C. Leopold Friday Bishop of the Windward Islands will ordain The Rev’d Mrs. Eleanor Candasie Glasgow to the Holy Order of the Priesthood. 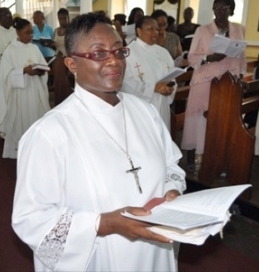 In 2011 she became the first female Deacon in the Windward Island Anglican Community, a role which provided for her to assist the Bishop and Priest in public worship and administration as well as oversee all the practical details. Her ordination to the Priesthood according to the 19 June 2013 circular from the Bishop will be held at the St Patrick’s Parish Church, Sauteurs in a service scheduled to begin at 5:00 pm. The occasion will also be used to ordain Mrs Myrtle Gordon and Ms. Yvette Calliste to the Holy Order of Deacons. Glasgow was not born into the Anglican faith. Her background was the Wesleyan Holiness Church until her conversion to the Anglican faith during her time at Christ Church Girls’ Foundation School and her journey to priesthood was triggered by her admiration for her Sunday school teacher. Deacon Glasgow grew up in Barbados where she attained a first degree and later a master’s degree in theology at Codrington College. She is married to Vincentian-born Christian Glasgow who is the Archdeacon of the Anglican Community in Grenada.